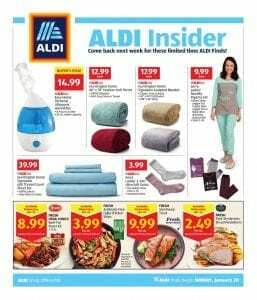 Limited ALDI finds are available now on Aldi Insider Ad Deals Jan 20 - 26 2019. All these products will be available at Aldi stores by Jan 20. There are beautiful homeware, clothing, kitchen appliances frozen food and more with limited stocks. First of all let's take a look at home products on first page. Here are useful personal ultrasonic humidifier to balance humidity of your home. If you have kids or babies, this product is very necessary to keep their noses open. Another cool product is blankets and throws by Huntington Home. Also see pyjamas and socks for ladies. On page 2, there are small kitchen appliances such as deep fryer, slow cooker, pizza pan, bakeware and more. Easy to make frozen meals are on this page too. You can find kitchen organisation tools like cabinet organizers, food storage sets, darker organisers and more on page 3. If you give importance to your health, please take a quick look at the health items like braces, stand assists, raised toilet seat, adjustable table etc. These items will make your daily life easier. Check out page 4 to look through home essentials and decorative items. Wax melts, metallic candles, decorative lanterns, rugs, photo collage items, pillows are the best picks.